A council that sold an ancient statue of an Egyptian priest for nearly £16m is to face a disciplinary session of the Museums Association. 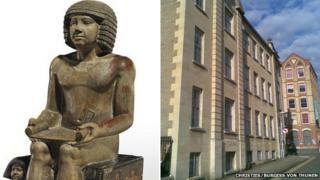 Northampton Borough Council must explain the reasons for the sale of the 4,000-year-old Sekhemka statue. It could face a further loss of funding at the meeting on 1 October. The council said the Arts Council had also withdrawn access to funding and it would respond to the Museums Association when this was resolved. Funds raised by the sale of the limestone Sekhemka statue in July were to be used to help expand Northampton Museum and Art Gallery. Negotiations were under way to begin a scheme to double the museum's exhibition space. The council said: "We are waiting to hear from Arts Council England and once we have considered their response we will comment further on how we intend to respond to the Museums Association." Sharon Heal, head of policy at the Museums Association, said: "We are genuinely concerned some local authorities could raise finance by disposing of parts of their collections by sale." The association said it had a range of sanctions, such as suspending membership and taking away accreditation, which could mean losing funding. "A summit of other funders, including the Heritage Lottery Fund and Arts Council, would also be called later in the year," Ms Heal said. "We already have a red list to protect heritage sites at risk. Now we will ask the summit members to create a similar list for collections."